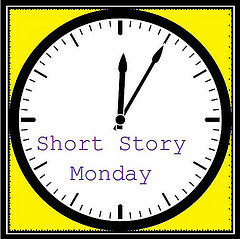 I missed a whole month of Short Story Mondays during May and I am glad to be back! Rainy season just started here last week so I searched for a story about rain. I was very happy to find a story from Alexander McCall Smith (No. 1 Ladies' Detective Agency) in The New Statesman, called Rain. It's not about metereological showers, but about blood, family, envy and expectations in a modern Scottish family. We are taken through the relationship between Ian and Riv, short for Ruthven not River, from first meeting at a disco through domesticity and parenthood. It culminates with the wise words of a passerby who comforts the men in the rain. I love the introduction to this chaptered short story ("There is no reason why novels should have chapters and short stories should not; breaking up a short story in this way allows for darting about in the narrative.") It features one of the best quotes I know about the relationship between the audience and an art form. There is a special category of emotion, I believe, that is invoked by artifice but that is powerful nonetheless. This story does a great job of evoking that emotion. It was a great way to come back to Short Story Monday after an absence. I love that it starts that way. Like breaking the first rule about fight club.